Unlike many, we don't hide behind a website. You are very welcome to call in to discuss your requirements in person. While we have many paintings in stock and are happy to let you browse, we must stress that our premises are a workshop and not a gallery! We are based in Chesterfield, England, but our customers come to us from all over the world for our specialist services. We also ship worldwide. Continue to West Bars Roundabout and go straight over to the left of the large grey Matalan building. The road you are on will merge with Chatsworth Road, continue until you reach the Morrisons roundabout. Take the 3rd exit down Old Hall Road - This is a one way road, so only approach from this direction! Turn right into the first archway; it may look too small for your car but it can comfortably let most cars pass. 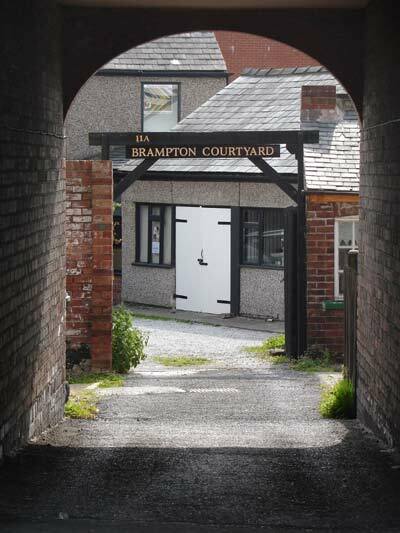 Through the wooden archway is our car park, with the entrance to the workshop directly ahead. We are well hidden but well worth finding!